Royal Canin Senior Consult Stage 1 is a complete feed for adult cats over 7 years old. Vitality complex – A selection of nutrients which meets the nutritional needs of mature cats. Moderate phosphorus content. Optimal energy – Adequate energy content to meet the needs of active mature cats. Dry food composition: dehydrated poultry protein, maize, wheat gluten*, rice, vegetable fibres, maize gluten, hydrolysed animal proteins, wheat, chicory pulp, animal fats, fish oil, minerals, soya oil, fructo-oligo-saccharides, psyllium husks and seeds, hydrolysed yeast (source of manno-oligo-saccharides), hydrolysed crustaceans (source of glucosamine), marigold extract (source of lutein), hydrolysed cartilage (source of chondroitin). ADDITIVES (per kg): Nutritional additives: Vitamin A: 20700 IU, Vitamin D3: 700 IU, E1 (Iron): 45 mg, E2 (Iodine): 4.5 mg, E4 (Copper): 8 mg, E5 (Manganese): 58 mg, E6 (Zinc): 174 mg, E8 (Selenium): 0.08 mg - Preservatives - Antioxidants. ANALYTICAL CONSTITUENTS: Protein: 36% - Fat content: 10% - Crude ash: 7.4% - Crude fibres: 5.4% - Phosphorus: 8 g/kg. *L.I.P. : protein selected for its very high assimilation. Wet food composition: meat and animal derivatives, cereals, derivatives of vegetable origin, vegetable protein extracts, oils and fats, minerals, yeasts, various sugars, molluscs and crustaceans. ADDITIVES (per kg): Nutritional additives: Vitamin D3: 390 IU, E1 (Iron): 3.8 mg, E2 (Iodine): 0.1 mg, E4 (Copper): 0.7 mg, E5 (Manganese): 1.2 mg, E6 (Zinc): 11.5 mg.
ANALYTICAL CONSTITUENTS: Protein: 8.5% - Fat content: 4% - Crude ash: 1.3% - Crude fibres: 1.6% - Moisture: 80%. Super product from Royal Canin. Supplied at a great price from Pet-supermarket with free delivery. 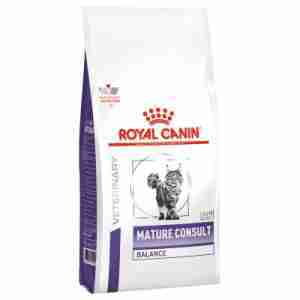 We give our 9 year old senior consult 1 and other foods suitable for his age by Royal Canin. We get peace of mind that he has the right balance of nuitrients. He likes it he would break open the cupboard and just scoff if he could. We have to resist his pleas for more for his sake. Readily accepted by most senior cats, stage 1 consult is an excellent choice for healthy cats.